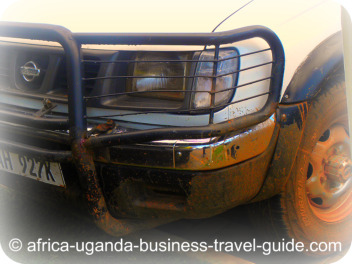 How to Travel Uganda: Hire a Car, Board a bus, charter a plane or take a boat. How Best To Travel Uganda. 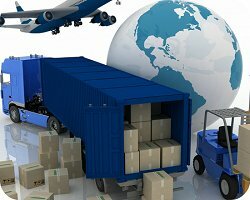 Information and tips to help you plan your business travels within Uganda. Plan the means of transport you will use to Travel Uganda; will you hire a Car, board a mini bus,or use charter plane? You need to be clear on how you will travel within Uganda and how much you want to spend on it. 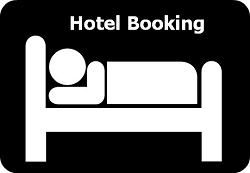 Use the information on this page to plan your travels right from Entebbe Airport, to your hotel, around town and to the country side. You also have the opportunity to ask any Uganda Travel question, just in case you get stuck! Road transport is the major means of travel between the Airport and Kampala, Uganda's Capital City. You have the option of arranging with your business partner to pick you up at the airport or use other Uganda airport shuttle services. You can also plan to hire a self-driven or chauffeur - driven car on arrival at Entebbe. You will need an international driving license if you choose to hire a self-driven car. The airport is connected to Kampala by a 42 kilo meters all-weather road. Traffic drives on the left and part of the road is dual carriage. The speed limit is 80 Km/h and you will normally take about forty minutes before you reach Kampala. You will experience heavy traffic on this route if you travel between 0800 and 0900 hours and 1700 and 1830 hours local time. You therefore need to factor these traffic delays in your business schedule if your flight arrives 30 minutes before these rash hours. You may also look out for yellow-band Cars for hire. Each taxi has an identification number and inscription "AIRPORT TAXI" in black letters. I advise you to note the identification number of the car you hire for reference. Hiring the Airport Taxi to Kampala should cost you between US$60 to US$100. Car hire to any other destination in Uganda is negotiable. Mini-bus commuters also operate the Airport-Entebbe Town routes. 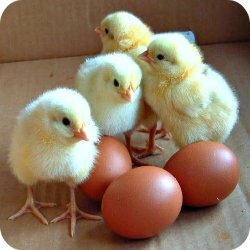 You can identify them by a blue square symbol on the front door. commuters from the Airport to Entebbe Town (Kitoro) a 4 kilometer journey, would cost you about one dollar. That is about Uganda Shillings 2500. From Entebbe Town to Kampala City commuters would charge you about one dollar. That is Uganda Shillings 2500. I would advise you to pay in Uganda currency, so buy some Uganda shillings at the airport, but bare in mind that the best Forex rates are in Kampala. Even though these commuters are the cheapest means of transport available, I do not recommend using them because they are limited to bus stops and taxi parks. 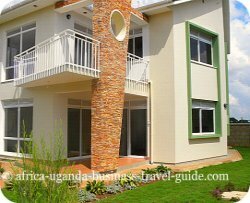 You may also choose to organize all your travels within Uganda with a registered Tours and Travel agent. You can reserve your car for Hire from Entebbe Airport to Any Destination in Uganda by filling out this Form. Click on this link to find out how to Travel Uganda with a Tours and Travel agent. 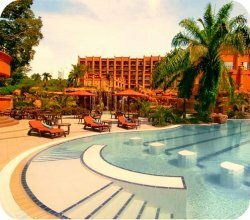 There are several tour_operators located in Kampala. The Uganda road network extends over 28,332km (17,605 miles). The roads to Travel Uganda are of variable quality and radiate from Kampala. The road network is sparse in Northern Uganda. You're likely to encounter a good number of pot-holes when driving within Kampala, I therefore, recommend driving in a raised 4 Wheel Drive Car and not to a low lying sports car. Some army and police check points still exist on our roads. The speed limit is between 50 mph (80 kph) and 62 mph (100 kph) on highways. Commuter mini-buses and Bus services run between most Up-country parts of Uganda and Kampala. I would not recommend these services for Business Travelers as buses are unreliable and often crowded. When making trips within and around Kampala you're better off using a Special Hired Vehicle. These are available near most of the hotels in Kampala. The best way to travel within Kampala is to use your business partner's company vehicle, it is way cheaper and safer....You may only have to fuel the car. As you travel Uganda in your own vehicle, remember to to Keep the doors always closed. When planning to make a tourism safari after your business engagements, plan it with a professional tours_operator with the proper vehicles to drive you to major attraction. 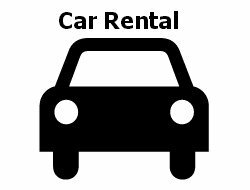 You can make your reservation for an appropriate Uganda Car for Rental/Hire by filling out this Form. 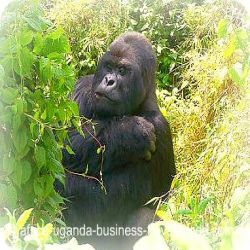 Click on this link to get more information about tour operators in Uganda. Travel Uganda by air if your journey outside Kampala would be more than 4 hours. You may opt to travel by road if you want to enjoy the scenery. However, when working on a tight business schedule this option will save you quality time. Uganda has 13 airfields spread all over the country; these include Arua, Gulu, Moroto, Kasese, Masindi, Mbarara, Jinja, Soroti, Pakuba, Tororo, Lira, Naguru, and Kisoro. All airfields are operational except Tororo and Lira. Eagle Air and United Airlines offer flights from Entebbe to most major towns in Uganda. United Airlines operates daily flights Monday to Friday to Arua Town, Moyo, Adjumani, and Yei. You may also ask for a charter flight in case you need a flexible flight schedule. Uganda Railways Corporation operates three ferries on Lake Victoria between Port Bell, Jinja, Kisumu (Kenya) and Mwanza (Tanzania). These services are mainly used for freight, although some passenger capacity also exists, with scope for upgrading to provide cabin accommodation. Connection between the islands on Lake Victoria is by local boat hire services. To Travel Uganda by Water on other lakes and rivers, for fun or other activities, remains an investment opportunity for you the business traveler. You can Hire a Uganda Boat by filling out this Form. 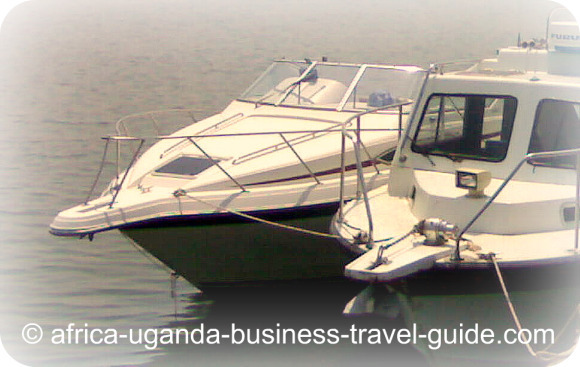 Click here for more information on how Travel Uganda by water and find private boat service operators on Lake Victoria. You can no longer Travel Uganda by train because there is currently no operational passenger train within the country. However, Uganda’s rail network is composed of an east-west branch line, which connects the country with the East Coast of Mombasa, Nairobi and extends to Kasese close to the Congo-Zaire border. Only the Nairobi – Mombasa link is currently operational. Are You Stuck?.. Ask that Puzzling Question Before U Travel Uganda! Do you have a question about the best way you should travel within Uganda? Ask the Travel Guide and other Uganda Visitors! You can ask anything about traveling in Uganda that you have failed to find on this website. Click here to see the rest of the form and complete your Travel Question.